I have a history of converting old bikes to single speed. After I'd jury-rigged four or five with sliders, I decided it was time to try doing one the hard way. I found a dumpster bike, made a set of track ends, and welded them in place. 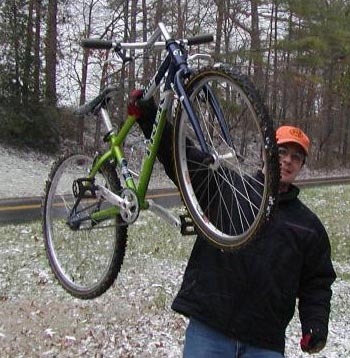 I wound up with a nice winter bike for the woods. In case I make all this sound too easy, I guess I should tell you that I teach auto mechanics at a school in Cambridge, MD, and I got some help from co-workers. Still, I believe that anyone with access to a basic machine shop and some means of welding could do a good job. Take it slowly, and don't be ashamed to ask for help from more experienced metalworkers. The bike I chose for conversion was a 13" Trek. It rode nicely enough, but I knew it wouldn't break my heart if anything went wrong. The first task was to make the track ends. I needed a big, flat plate to give the bike a strong, stiff rear end. (When you do your own work, you can make things exactly how you want.) I sketched shapes on card for a while until I had come up with a design I liked, then cut the card and traced the outline onto 1/4" plate steel. Next, I cut the plate with a torch, and cleaned the ends up with a grinder. Now it was time to work on the frame. I was planning on using an old 110mm flip-flop hub, so I needed to respace the rear end. (It's easy enough to coldset steel, and with patience you can work on aluminum too.) After checking the alignment of the frame, I cut out the old vdrops with a hacksaw, and slid the new ones into place for a mockup. The ends fit fine. 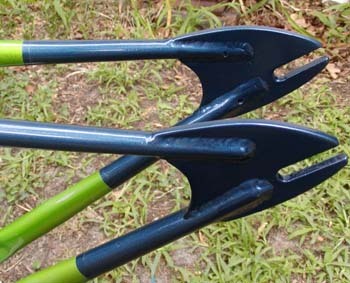 In fact, they were tight enough that I had to tap them into place with a hammer--a good sign. I'd done pretty well so far, but from here on I would need some help. First, I coopted a machinist friend to cut me an aluminum spacer from a cylindrical billet, and dug out a long bolt from the parts bin. 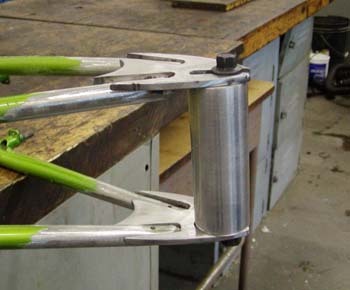 This assembly would hold the ends in place during welding. Then I went to see the welding teacher at school, Ray O'Brien. Ray, who once welded for a Belfast shipbuilder, had promised to do the actual welding for me. Before taking the frame, I carefully cleaned all the paint off the ends with the grinder. Stray paint can contaminate a weld, weakening it, and I didn't want Ray to waste his time prepping. Ray did a beautiful job with the TIG welder, and one check with the hub told me that the bike's new rear end was true. I mixed up two shades of blue Deltron basecoat to match the Trek blue--close enough--then finished with cheap Kirker clear. I built it up with old-style BMX cruiser wheels, Sun No.5 Orange rims on high-flange, and some used cranks. The cranks were Specialized Hardrocks, actually a pair of rights, with the spider hacked off on the non-drive side. I had to flip the ring to get good chainline, but everything came together pretty well. Michael Perry lives near Delaware on the Delmarva Peninsula with his wife and son. He thoroughly enjoys cobbling anything that has wheels, and going fast. Mike has an online gallery of bike and car projects, featuring his beautiful custom paint jobs.